Does anyone else out there read Mind Bullets? If not, I’d thoroughly recommend it. Or else wait for me to occasionally post on it (when it’s appropriate to this forum). The most recent post certainly is. 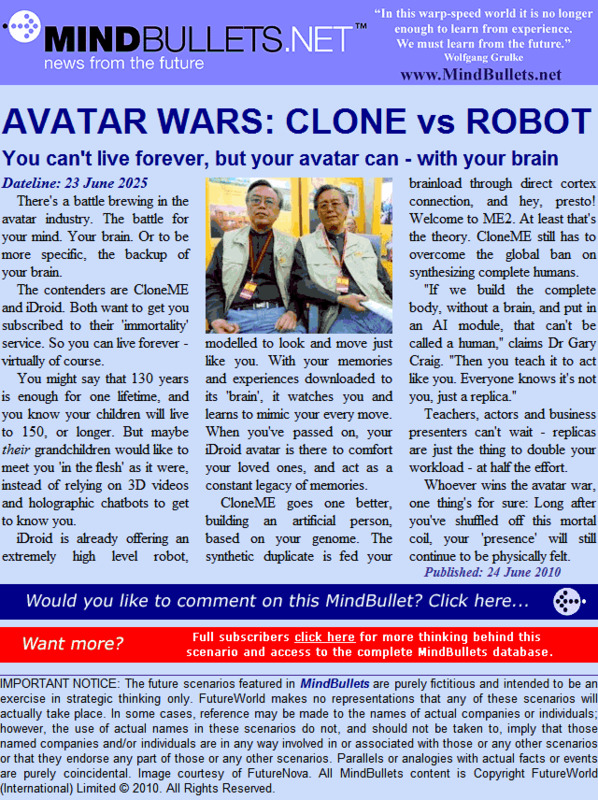 Mind Bullets, for the uninitiated, is part of the FutureWorlds network. Basically, a bunch of really interesting people like to cast their minds into the future and write about possible scenarios. It’s a mental exercise, but one involving futurism. Great fun, in other words. It’s certainly an interesting concept. Of course, we’re some way off being able to clone people (and even if we could, waiting the years necessary for clones to reach adulthood sounds like an extreme exercise in patience). As for the robots – slightly more likely. Then again, if I could choose a robot body, I’m really not sure I’d want a copy of the one I’m currently inhabiting. aimee 2.0 could definitely be designed better. It does beg the question, though – who would the facsimile be for? If it’s for family (a kind of macabre, living urn) then it makes sense that it should be as close to the original as possible. Otherwise, I really don’t see the point. Also, I’m assuming that the robots would get to know and mimic one when, well, aged. Being aged for eternity (or close) seems somewhat depressing. There’re a lot of other issues raised by this article, too. Rather than going into them in any length here, I’m going to yell “discuss!” and stand back. Further information (from MB) is provided below, for your edification. Though there is little prospect of creating a genuinely conscious robo-clone in the foreseeable future, several companies are taking the first steps in that direction. Their initial goal is to enable you to create a lifelike digital representation, or avatar, that can continue long after your biological body has decomposed. This digitised “twin” might be able to provide valuable lessons for your great-grandchildren – as well as giving them a good idea of what their ancestor was like. The Robots and tentacles post opens up all sorts of possibilities for alternative robot bodies. I suspect Gold 2.0 would be, in it’s default configuration (I see no real reason to settle on one), would be aquatic.